On April 3, 2018, at approximately 12:45 p.m., an active shooter incident took place at the YouTube campus located at 901 Cherry Avenue in San Bruno. As expected, San Bruno Police Department’s Communication Center was quickly inundated with 911 calls reporting the incident. 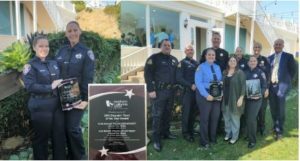 Per the virtual dispatch partnership with the San Bruno Police Department, Burlingame Police Department Dispatchers immediately began assisting by answering overflow 911 calls from YouTube employees who were trying to report the incident, relay information or request help. Dispatchers worked quickly, calmly, and efficiently to help gather details critical to the law enforcement response. Please vote for our team to acknowledge their excellent performance during this extremely tense and challenging situation.